Enoki mushrooms, also called enokitake (エノキタケ), are slender and exceedingly delicate mushrooms with long thin stems, and tiny white caps. In Chinese, they are called as Jinzhen-gu (golden needle mushrooms) since they resemble to the dried tiger lily buds. Fresh as well as dried enokitake are popular mushrooms in China, Vietnam, Korea and Japan. Enoki mushrooms in plastic bag. Enokitake features elongated fruiting body, comprising of long thin stalk and small, biconvex cap. Completely grown enoki measures 10-15 cm in length and 1-3 cm diametered small caps. In Japan, it is cultivated in different sized bottles according to the market preferences. Enoki has a mild fruity flavor and chewy texture. Enokitake is a winter fungus which prefers milder average temperature to produce thin, elongated stems and small caps. In the natural, wild enoki appear on the persimmon, Chinese hackberry, and sometimes pine forests. Wild enokitake tends to be pigmented, feature short stem and broad, brown caps. Cultivated enoki requires dark, cold, high carbon-diaoxide surroundings for ideal growth. Farmers usually grow in bottles, on spawn inoculated degradable lignocellulosic bio-residues such as corncobs, wood straw as nutrients for their growth and fructification. Many cultivated varieties with white stems and caps are developed keeping in mind of consumer preferences. Enoki mushroom is very low calorie fungus. 100 grams of fresh enoki carry about 37 calories. Laboratory studies on animals suggests that proflamin, a scompound in F. velutipes has been fund to have anti-tumor activity against cancers such as adenocarcinoma, melanoma etc. in animal studies. Enoki mushroom is another fungal candidate with an ideal source of B-complex vitamins. It contains pantothenic acid-27%, niacin-44%, folates-12%, thiamin-19%, and riboflavin-15% of daily required values. Many of these vitamins involve in protein, fat and carbohydrate metabolism inside the cells, as co-factors for substrate enzymes. Enokitake contains more niacin than many other edible mushrooms. 100 gras of enoki carries 7.032 mg of niacin. Niacin helps in the prevention of pellagra disease. Just like shiitake mushroom, enokitake too carries good amount (105 mg or 15% DV) of Phosphorus. Adequate calcium and phosphorus levels in the blood is critical for the proper mineralisation of bone and teeth. Enoki is very good source of potassium, an anti-sodium electrolyte. 100 grams of fresh enoki carries 359 mg or 7.5 % of potassium. Enoki does not has much of vitamin-D (ergocalciferol, 4 IU/100 g), unlike other large sized mushrooms like bolete. Further, it is a good source of minerals such as phosphorus-15%, copper-12%, zinc-6%, and iron-14% of daily values. Enokitake mushroom nutrition profile (Flammulina velutipes), fresh, values per 100 g.
Enoki is best available in from October till May; hence, the name winter mushroom. In the stores, one can easily identify by their strikingly long stems and tiny caps, usually wrapped in cling films, from a distance in the vegetable/mushroom sections. Choose white, firm and shiny enoki mushrooms. They are sold in bunches in plastic containers/wraps, especially in Asian grocery stores. Avoid any that have damp, slimy patched and those that have discoloration. They also sold in jars or cans, but prefer fresh over canned. If bought fresh enoki mushrooms, they will keep for one week in their packaging when placed in the salad compartment of a refrigerator. Enoki is one of the delicate gourmet mushrooms. Fresh mushrooms rarely requires washing. The mushrooms are harvested in clumps, attached to a tough, spongy root base which is cutoff. So, trim 1-1.5 inch lower clump base before using in the recipes. You can use of these trim ends to make stock. Soak dry enoki mushroom in warm water for 10 minutes to rehydrate. 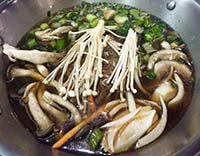 Do not discard the soaking liquid as it can add flavor to stock; or use in soups, sauces, stews, and stir-fries. Do not overcook, add at the end of cooking time. Enoki mushrooms have a delicate sweet and almost fruity flavor, and a delicate soft texture. Enoki mushrooms are delicious raw. They decorate and flavor salads, and vegetables and stir-fried dishes. Nametake is a popular rice dish served with sauteed enoki with seasonings of soysauce, mirin and herbs. They can be added in soups, sauces, pasta dishes, stews, and omelets. Allergic reactions to enoki mushroom is rare. Some sensitised persons who actively take part in the cultivation may develop allergic contact dermatitis to this mushroom. (Medical disclaimer). Morel mushrooms nutrition facts and health benefits. Truffles nutrition facts and health benefits. <<-Back to Mushrooms from Enoki mushroom nutrition. Visit here for an impressive list of edile mushrooms with complete illustrations of their nutrition facts and health benefits.